For those who enjoy cooking and experimenting with new flavors, the thrill of a creative new recipe never ceases to amaze. Give this innovative and delicious recipe for blood orange and garlic aioli on slow-cooked turkey burgers a whirl. It's a great way to enjoy a healthier version of the hamburger and your friends will love digging into these flavorful patties topped with two toasted English muffins. When entertaining, slow cooking your turkey burgers is a great way to allow yourself more time to prepare. Once the patties have been made, you can control cook time with the programmable countdown slow cooker. The Crock-Pot® 6.5-Quart Countdown Touchscreen Digital Slow Cooker allows you to set cook time anywhere from 3 to 20 hours on the high or low temperature settings, optimizing flexibility and preparation time. For example, cook times can be shortened or lengthened depending on your needs. If you won't by home by the time the slow cooker is finished, simply set a longer time and it will adjust accordingly. Customizable cook times help your party go off without a hitch! 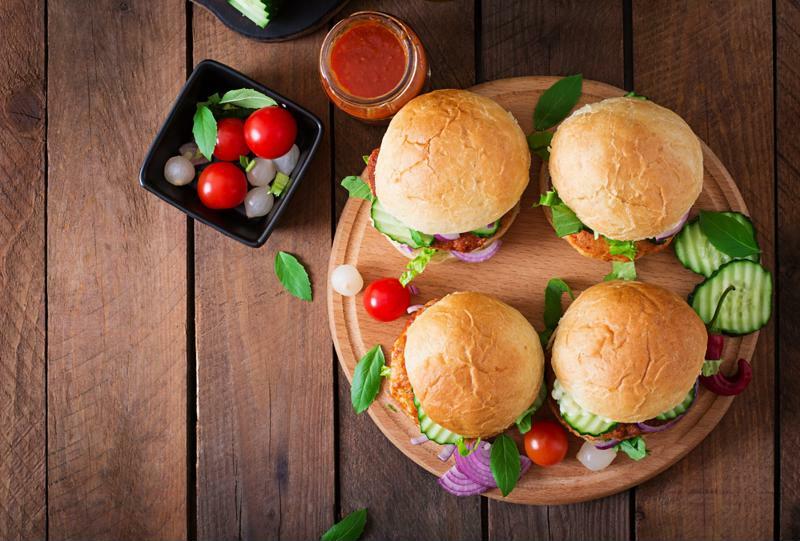 Substituting turkey for beef gives these burgers a healthy flair and the addition of spices, cheese and orange zest make for a delicious mouthful with each bite. Use a non-stick cooking spray in the bottom of your slow cooker. In a food processor, combine the cilantro and onion until well combined. Add pine nuts and process until well incorporated. Add chiles, cotija cheese, orange zest, 1 beaten egg, ground turkey, cumin, oregano leaves, garlic, salt and pepper. Divide mixture into 4 large patties, or 8 smaller patties. Use hands to form patties and place in bottom of slow cooker. Cover and cook on low for 3 to 4 hours or on high for 1 1/2 to 2 hours, until cooked through. Cook time may vary depending on thickness of patties. Serve on toasted English muffins with blood orange and garlic aioli from recipe below and desired toppings. Slow cooking turkey burgers is a healthy and tasty alternative for making hamburgers. Creating this zesty and flavorful aioli while your turkey burgers are slow cooking is easy. What's more, this special sauce will tantalize your taste buds for the burgers to come. Add the egg and mustard and process until smooth. Use the processor chute to add the olive oil. Then add orange juice and zest and mashed garlic. Pulse to combine well, adding salt and pepper as necessary for desired taste. Spread aioli on either side of toasted English muffins and top with turkey burger, lettuce and tomato.